A lot of vegetarians are hugely concerned about the lack of protein in their diet. Their concerns, however are misplaced, as they can get enough to meet their daily needs and more through a healthy wholesome vegan diet has. What is protein ? It is a food for growth and repair. The next question we need to ask is – how much protein do we really need? Human milk contains 1.5 to 2.7% protein and this amount is sufficient to help a new born grow rather rapidly. It doubles its weight in 6 months and triples it in one year, after which the rate of growth slows down. As adults, we require only 3 – 8 % of our calories to come from protein to have a sufficient amount, and this is not at all difficult on a plant based diet as all plant foods have protein. If you’re still not convinced, look to animals in nature for the conviction. Some of the strongest animals are herbivores, not carnivores. Elephants and horses don’t have any meat, and meet all their requirements from plants, and they are never deficient. Examine the human body and you will find it has more similarities to herbivores than carnivores. 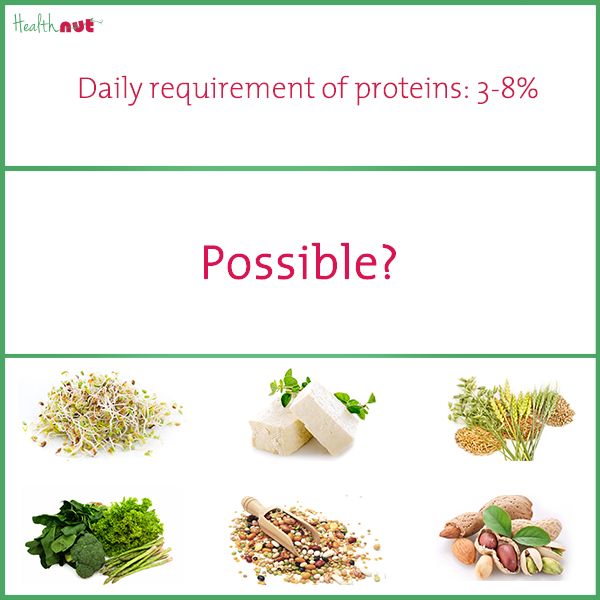 Some excellent sources of protein from plant sources are – sprouts, nuts, seeds, peanuts, dark leafy greens, peas, whole grains, chickpeas, soya beans, tofu, beans and legumes.